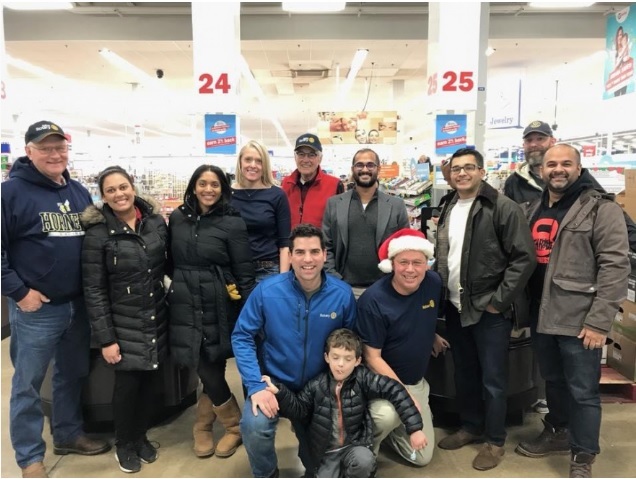 Members of Saline Rotary Club and Mullick Foundation are pictured at the Meijer store during the 2017 Mullick Challenge event, which provides gift money, children's books and holiday food items for families in need at the holidays. The Mullick Foundation, in collaboration with the Rotary Club of Saline, will host the fourth annual Mullick Challenge on Saturday, Dec. 8, 2018 at the Meijer on Ann Arbor-Saline Road. Each year hundreds of children are supplied free books, $50 to spend on anything they would like, and their families are provided with a Butterball gift certificate and food items for their a holiday dinner. Young people are notified through Head Start programs, schools, and other social service organizations in the Ann Arbor, Ypsilanti, and Milan areas. Dozens of volunteers from both the Mullick Foundation and Saline Rotary will be on hand to prep the food boxes, check families in, bag groceries, and provide smiles and good cheer this holiday season. “During the holidays we, at the Mullick Foundation, hope that families can enjoy quality time together. We want children to remember this time of year as one for celebration and traditions. So the Mullick Foundation has teamed up with the Saline Rotary Club and Meijer to provide kids and their families some holiday essentials," said Joey Mullick, of the Mullick Foundation. "We hope this small gift adds some extra joy this season, and wish everyone a Happy New Year!? Saline Rotary Club has been participating in this holiday event since 2001. Back then, it was called the Fagin Challenge - named for Rotarian and former Ann Arbor business owner Jack Fagin. “This event is very close to Saline Rotary’s heart. Jack Fagin was one of the finest people you could ever meet," said Jill Durnen, club administrator for Saline Rotary Club. "He started the Challenge to engage the Saline Rotary Club members and help underprivileged kids in the Saline/Ann Arbor Area at the holidays. When the Mullick Foundation took over in 2014 after Jack’s passing, the event was re-energized with new ideas and expanded to help many more kids in Saline, Ann Arbor, Milan and Ypsilanti." Members of Rotary and the Mullick Foundation are happy to help less fortunate families at this special time of year. "Seeing the looks on the faces of the children as they get to go shopping is the best part of our holiday season," Durnen said.